Everyone has a hook…whether they know it or not. Everyone needs a hook…whether they know it or not. Everyone should have a hook…and I’m gonna tell you how to find it and where it needs to go on your LinkedIn profile. Does it make me sound interesting and worth reading about? Does it reach for the opportunity I actually want? Does it showcase my talents and skills? All three of these items need to be in place before a hook actually even matters. Why? Because even if you have the best hook in the biz, once they get past that and see only fluff, they will click away and click away fast. To really hone in on your hook you need to do just one thing. 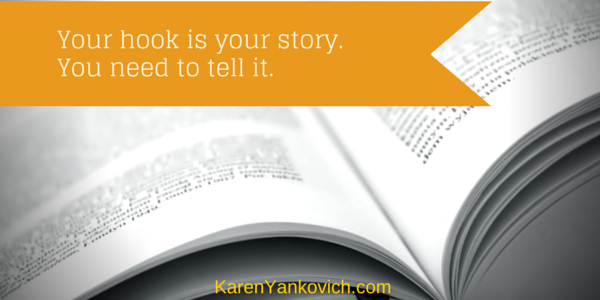 You need to tell a story. Plain and simple. Your hook is your story. You need to tell it. If you are talking about your skills – tell a story in which you used one to great success, or humorous (but inspirational) failure. If you are explaining what opportunity you want to find – tell a story that showcases who you are looking for on LinkedIn and exactly why. If you are establishing your expert status – tell an authentic story that speaks to your ideal client, why you can help them, what results they get, and why it matters to YOU. Maybe you really want to do all three at once, but I caution you at biting off more than you can chew. Not picking what “type” of LinkedIn profile you have is certain to make your summary and experience sections sound jumbled, unsure, and a mish mosh of ideas with no one theme rising to the top. Need some help figuring that out? Take a look at my blog post “6 LinkedIn Profile Types” to find out more. Once you pick that specific story there are a few ways you can integrate it into your summary. What would YOU do if your life suddenly became a country song? Well it happened to me… and that’s why I am now one of the most successful financial planners in the western states. Highlight your hook with a quote and means a lot to you, has the same general theme and tone, and will inspire. “There is no innovation and creativity without failure. Period.” ~ Brene Brown When I was 25 I lost my mom, and I knew then I wanted to be a grief coach to help others navigate the same. 70,000 books will be published this year. I plan on publishing #70,001. What’s your goal? I help inspire people to write their dreams, I do hope I can help you too. Now that you’ve established your hook inside your summary section, move on to experience. In the details and descriptions don’t hesitate to use the same techniques as in the summary section. Practice by remembering your proudest moments and top successes for each job you are listing. Be bold and brag big! Use these sections to highlight an accomplishment for each job history. Don’t have one? Tell us why you got the job, what purpose it served and how you worked hard to find out what you really wanted to do with your life. Finally your interests, your volunteer work, your projects, and your contact me section should all clearly back up and expand on this hook. You talk about failure: make sure your interests include your favorite books on how to rise above and triumph! You talk about grief: make sure you list that volunteer work you did for the hospice. You talk about writing: make sure you list that half finished book in the drawer that you scratch out time to write late at night and on weekends. Use drama, use empathy, use mystery and truth. Find your hook and use it. Everywhere. For more help, more ideas, and some insight on if you are using your hook to its full potential join my LinkedIn group! Click Here. Hey Karin, these are some really great suggestions on how to make my LinkedIn more interesting but still of value. You offered some concrete ways – ones I had never considered – to showcase my “gems” while adding some heart to my profile. Well formatted, skillful storytelling in your post, illustrating your points perfectly. I have never thought of using a hook or storytelling for a LinkedIn profile. Insightful and great action points for keeping your readers intrigued. Thanks for this post. I think the hook idea has me hooked, as a reminder of using it across the board in my profiles and writing. Great post. Love it Jul! Thanks for sharing. Great post, Karen! Having a hook like this is so important for ALL aspects of your content. It makes things so much easier! I love this article, Karen! It’s making me want to go through the process myself. I plan to use these questions as I re-write my website- love the “if my life were a country song” prompt! Thanks for sharing your expertise!